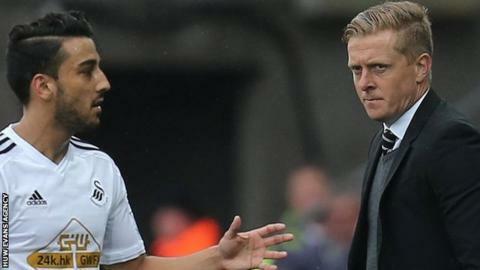 Swansea City manager Garry Monk praised his side's 2-0 win against Stoke as a "complete performance". Saturday's victory closed the gap between the eighth-placed Swans and Southampton in seventh to four points, with three Premier League games left. Monk says overhauling Saints is possible, but is more concerned with securing a top-half finish. "It's feasible but we keep our feet firmly on the ground... it's important we finish in that top 10," he said. "The key to it was trying to consolidate that top 10 finish. "It's not guaranteed, but this [win] went a long way to helping that cause. "We're in eighth place now and this helps us control that… but we've got three very tough games coming up so we're realistic as well." After a goalless first half, Swansea put Stoke under intense pressure in the second and sealed victory with goals from Jefferson Montero and Ki Sung-yueng. Monk had said before the match his players were prepared for the physical challenge Stoke would pose. The Swans lived up to their billing with a committed display against their imposing opponents. "It's key. We can do all sides - we've got that bit about us where we're not going to get bullied," said Monk. "I thought we stood up to everything. I was extremely pleased. "I thought it was a complete performance in the second half. I thought we really did dominate in every area." Swansea suffered another injury as striker Nelson Oliveira was taken off during the first half. Monk confirmed Portugal international Oliveira had hurt an ankle, while defender Jordi Amat was left out of the match-day squad because of a foot injury sustained during training in the week. The Swansea manager does not know how long each player will be missing with their respective injuries. But he is pleased with how his squad has coped with recent withdrawals. "It makes it more pleasing, the injuries we've had and the suspensions we've had to deal with," said Monk. "We've been very thin on the ground, but it shows the quality and the togetherness of the squad. They get on with it."